K&G Striping, Inc. was started in 1982 as a way for Ken and Glen to make additional income for their families. For the first two years it was just the 2 of them working long hours, weekends and nights. In 2007 Frank and Jay took over the company and stayed true to the core values of which the company was founded: Professionalism, Reliability, Innovativeness, Responsiveness, and Dedication. 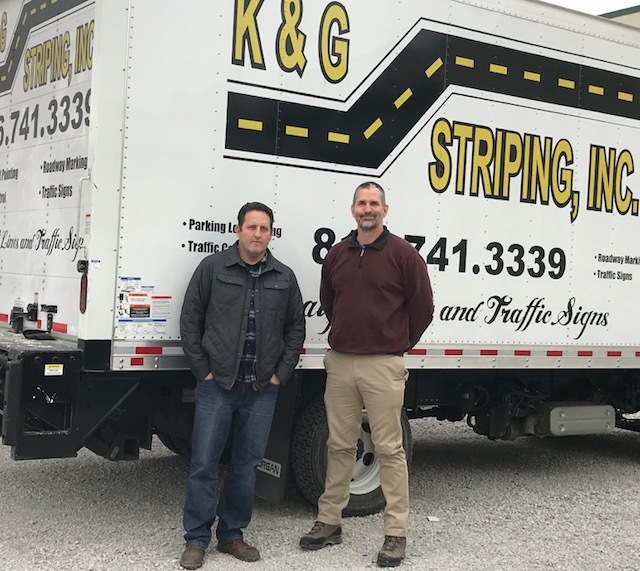 Because of that sustained commitment, K&G Striping has emerged as the market leader in the Kansas City area. Incorporated in 1989, K & G Striping, Inc. has worked diligently to perform services to instill the safety needed for drivers on the road. We use the most reliable products available while serving the Greater Kansas City surrounding areas. Our services include parking lot striping, roadway markings, traffic sign installation & traffic control. K&G Striping, Inc. is Kansas City’s premier traffic solutions specialist. Relying on 30 years of experience, we provide our customers a streamlined process for any job large or small. As innovative thinkers, and experts in the industry we combine our professionalism and reliability to help your company succeed. Our vision is to be the industry standard in our community while inspiring our customers with our cutting edge approach.